Do you know where your fool is? 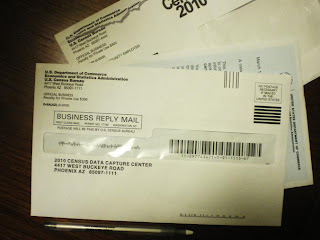 Being a good upholding citizen, Grandma J filled out her census data and was already to mail it early....like last Saturday. But low and behold, she received yet another piece of mail from the Census People. This postcard. So, Grandma J is guessing they don't thing she's "all there"....so they have to remind her again that the deadline is April 1st. NO JOKE? According to the census people, if Grandma J doesn't mail her response in by the 1st of April, they will send someone in person. Does anyone think Grandma J should pass up this last piece of the Census pie?? Grandma J will let you know when they come knocking. She'll try to get pictures. Maybe she'll have a contest to guess how many tats the representative as...or something similar. Today is a day to reckon with......no joke! Grandma J will be back to fill in the blanks after her daily chauffering, swimming, and her annual pina colada coupon redemption. I think your busy schedule warrants a pina colada redemption or three. I took a mental health day today and so I know that my fool is sitting across the room from me .. HA! I know you don't do Farmville but I am growing Nachos for April Fools Day. They started off as a bag of chips. Very clever. I filled out my census and mailed it....only to recieve the post card as well. I did not play one joke today. I am seriously slipping. Tats are Ok. As long as they don't have brass knuckles. 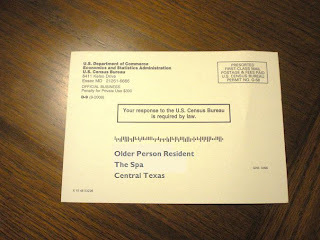 You know, Grandma J---I got a letter letting me know the census was coming. I got the census form in the mail. Just the other day, I got a postcard, too, telling me to fill it out and send it back. Now, who is dumber: me or the government? I'm not the one who has paid for 3 mailings to get 1 thing done. 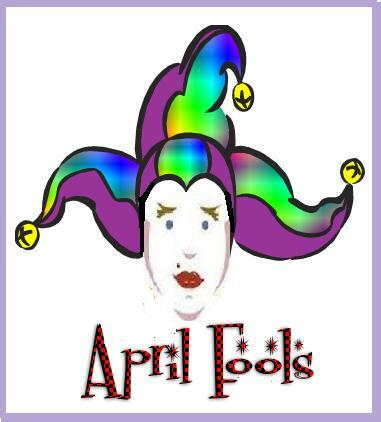 Happy April Fools Day, GrandmaJ! I feel like I spent the entire day riding in a car stuck in traffic with my fool, John, behind the wheel. It wasn't much fun, but we had a meeting waaaaay downtown. I hope yours was better! What does it mean if we didn't get any census information in the mail? That we don't exist?